“Go and make disciples of all nations, baptizing them in the name of the Father and of the Son and of the Holy Spirit” (Matthew 28:19). These words are why WELS does mission work, both at home and abroad. God tells us to “Go” and preach the saving message of Jesus to all people. But we can be hesitant at times. This is nothing new—even Jesus’ own disciples were uncertain. Just before Jesus gave the Great Commission, Matthew records that “When [the disciples] saw [Jesus], they worshiped him, but some doubted” (Matthew 28:17). The disciples are face-to-face with their risen Lord, yet there were still some doubts. Are we different from the disciples? At times, don’t we have doubts about God’s promises? This is why Jesus prefaced his command to proclaim the gospel with this declaration: “All authority in heaven and on earth has been given to me” (Matthew 28:18). His power is there to help us “Go” and carry the saving truth to other people. With that reassurance from Christ in mind, WELS Home and World Missions has started a new program called “WELS Mission Journeys” to allow WELS members to take short-term mission trips to “Go” and proclaim this saving gospel message. Mission Journeys trips last 3-14 days and give WELS members the chance to serve a congregation in North America or a world mission field. The trips are designed to help fill a ministry need or enhance the work already happening. This could be canvassing, vacation Bible school, music or sports camps, and any number of other ideas. With WELS members seeking opportunities to “serve one another in love” (Galatians 5:13), Mission Journeys helps match eager volunteers with mission fields that need help in sharing the gospel message. The program is designed for lay members and called workers to “Go” and be team leaders and members by providing the team with devotions for all three phases of the experience: pre-trip, trip, and post-trip. This gives the teams time around God’s Word, so the Holy Spirit can fill them up as they prepare and share Jesus with those around them. The training is designed for busy people, yet it still offers a foundation of team building, culture, and discipleship. We also “Go” because people without God are missing something. The saving gospel gives people what is truly needed: the peace of being a redeemed child of God. 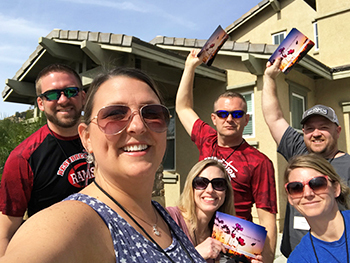 Mission Journeys participants let their light shine and proclaim God’s Word while serving on these trips. What a joy-filled privilege to share the gospel of Jesus Christ with others! After having served on a mission trip, the teams gain a new perspective, confidence, and joy in outreach that they bring home to their own congregations. There is a new urgency to “Go” and reach out to their local communities as they realize everyone needs God’s love. Your past prayers and support of WELS Home and World Missions have allowed us to launch this new program that helps members fulfill the Great Commission. Thank you! Now there is a new way to get involved with mission work. Would you and your congregation be interested in sending or hosting a mission team? Maybe you would like to participate in Mission Journeys? If so, talk with your pastor and other congregational leaders and share this opportunity and webpage: wels.net/missionjourneys. Would you also consider supporting this new mission program to help others “Go” through your prayers and financial gifts? Together we can walk in the Great Commission. For the program, members age 13 and up from a congregation or school will sign up for the trip as a group. Training, which includes team building and culture awareness, then will be provided. Events on the trips could range from canvassing to helping run vacation Bible schools or soccer camps. “It all depends on what the field needs,” says Bohme. Congregations will fund the trips on their own, with WELS Missions providing the training and coordination needed to make the trips happen. After the trip, the team and its supporting organization will be encouraged to conduct an outreach event in its own community. Three congregations have already participated in the pilot program: St. Matthew’s, Oconomowoc, Wis., and Goodview Trinity, Goodview, Minn., both sent teams to Ecuador, and St. Martin’s, Watertown, S.D., sent members to East Asia. Bohme says more international trips are already in the works for the upcoming year, including five more trips to East Asia. Several trips are also being planned to the Apache Reservation to help with its upcoming 125th anniversary of WELS mission work. Other domestic trips are being considered, though Bohme says that the program still is looking for more volunteers and more congregations that need outreach help. Mission Journeys is also forging partnerships with congregations, schools, and other WELS ministries that set up their own mission outreach trips, offering training and organization expertise to help ensure that the trips are “effective” and are complementing the missions’ goals. Currently Mission Journeys is working with groups traveling to Paraguay and Mozambique. Want to get involved in WELS Mission Journeys? Sign up to host a team or to be part of a team. Learn more at wels.net/missionjourneys. View an interview with Bohme about Mission Journeys.